The Grand River Classic Car and Motorcycle Days and the MG Car Club Rallye are two events that motor into Glenwood Springs annually. Those “lookin’ for adventure,” need only add Steppenwolf’s “Born to be Wild” track to their playlists and head to Glenwood Springs, Colorado, in June and July to see the cars that have inspired generations ever since Henry Ford first starting rolling Model Ts off the assembly line in 1908. Grand River Classic Car and Motorcycle Days features over 150 vintage cars and motorcycle. Classic cars represent a form of art that is distinctive to the United States; since the beginning of automobile production American cars have been known for their design and pleasing lines. Classic cars, classic rock and roll, classic summertime fun; it’s an unbeatable combination that will “get your motor runnin'," and it all happens in Glenwood Springs, Colorado, a scenic 150-mile drive from Denver through Glenwood Canyon. On June 10-12, the 59th annual MG Car Club Rallye rolls into town; this is the nation’s oldest continuous road rally. On July 29-31, the [Grand River Classic Car and Motorcycle Days shifts into high gear, showcasing original and restored vehicles that represent nearly every decade since the early 1900s. Dennis Bader, who helps organize the [Grand River Classic Car and Motorcycle Days concurs, “Classic cars represent a form of art that is distinctive to the United States; since the beginning of automobile production American cars have been known for their design and pleasing lines,” he said. Although the show is not exclusive to American-made autos, they tend to predominate. Bader is planning on showing both his Ford Model A and his 1968 Honda CT90 motorcycle. The 8th Annual Grand River Classic Car and Motorcycle Days begins Friday, July 29, with a ‘cruise night’ and a street dance and barbeque that is open to the community. Festivities are centered around Vicco’s Charcoalburger Drive-In, located along Highway 6 in West Glenwood Springs. On Saturday morning, up to 150 cars and motorcycles are expected to line up along 7th Street in downtown Glenwood Springs, making it easy for spectators to admire, possibly peek under the hood, and even ask owners questions about their unique hobby. During the show, a sound stage will play car theme songs like “Born to Be Wild,” “Mustang Sally,” “Little Deuce Coup” and more. Adding to the small-town charm, the local Kiwanis Club will be serving a pancake breakfast. Prizes for the event include Owner’s Choice, Judge’s Choice, Ladies’ Choice, and People’s Choice; anyone can cast a vote for their favorite vehicle in this final category. Enjoy the show all day from 9:00 AM to 4:00 PM. Another entertaining classic car event that drives into Glenwood Springs this summer is the MG Car Club Rallye, June 10-12. Though this group embraces sports cars of many varieties these days, the MG Car Club Rallye originally featured cars manufactured by Morris Garages of Oxford, England, better known as MGs. The British sports car devotees from the MG Car Club Rocky Mountain Centre in Denver began the annual road rally in 1953, long before Eisenhower Tunnel and the engineering marvel of Interstate-70 through Glenwood Canyon existed. Traversing multiple mountain passes on two-lane roads, those early races typically took 12 hours to complete. The traditional road rally is a time, speed and distance competition with drivers penalized for arriving early or late at any of the multiple check-in points along the scenic drive. 2011 marks the 59th year for the event. The three-day event starts Friday, June 10, with the rally departing Arvada for Glenwood Springs. The following day is a driving tour and scavenger hunt that starts and ends in Glenwood Springs. The final event of the weekend includes a car show at Two Rivers Park and a funkhana, or driving skills competition similar to an obstacle course. This summer, find adventure. Head out on the highway to Glenwood Springs. To learn more about with these classic car events, please visit http://www.visitglenwood.com/. Glenwood Springs is located between Aspen and Vail, 165 miles west of Denver or 90 miles east of Grand Junction on I-70 off Exit 116. For more information about Glenwood Springs, Colorado, call 970-945-6589 or go to http://www.visitglenwood.com/. For lodging reservations, call 888-4-GLENWOOD (888-445-3696). A complete press kit and press releases are available at http://www.visitglenwood.com/press-kit and http://www.visitglenwood.com/press-releases. Access to downloadable photos is available at http://www.visitglenwood.com/photos. See classic cars that represent nearly every decade of automotive history. 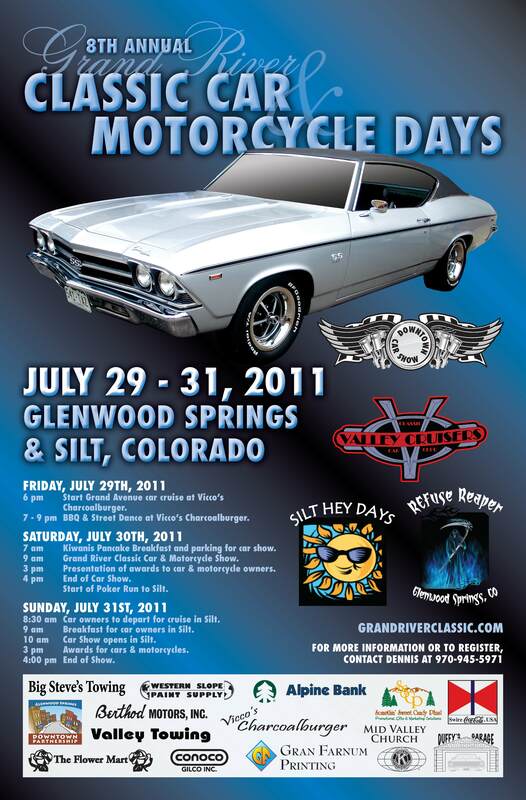 Grand River Classic Car and Motorcycle Days takes place July 29-31, in Glenwood Springs, Colorado. The MG Car Club Rallye hosts a car show where spectators can peek under the hoods of vintage sports cars. The MG Car Club Rallye stops in Glenwood Springs June 10-12.